How Does Hard Drive Recovery Work? Think of your hard drive like the engine in your vehicle, without that engine it would cease to function, yet few give thought to the inner mechanics, we simply add fuel, turn on the ignition, then arrive at our destinations. However, should that engine (or your hard drive) fail to function; you will no longer have the means to safely travel the highways and byways of the world, or in this case, the infrastructure of the Internet. Your hard drive, whether it's old or new, internal or external, Serial ATA (SATA), (IDE, EIDE), SCSI, or SAS is the engine central to the safe and lasting retention of your data. That data may represent months of work, valuable information or treasured memories. That engine, your hard drive, operates tirelessly and most of us think it will continue indefinitely, but often that is not the case. Like the engine in your vehicle, there are times when a good mechanic (or in this case a skilled technician) must lend a hand to keep it running smoothly, or sometimes perform hard drive recovery. It's possible you may never need our services, and should that be the case, we wish you God speed. However, should the time come and your hard drive fails, we have built our reputation on doing one thing better than anyone, hard drive recovery in London. Just as an automotive mechanic uses the latest tools, our skilled hard drive recovery specialists (collectively with over 30 years of experience) use proprietary software and operate in ISO standard clean rooms, ensuring your data is recovered quickly and cost effectively. In today's technological world, there are a multitude of disciplines, but one thing is central to all, the engine, the heart, the core where data is stored, the hard drive. And whether this engine resides inside a Windows system, Apple, Linux or UNIX, our team has been there and back, we understand the territory and our record of success and customer satisfaction is unparalleled. If you're wondering how it works, if you're concerned about whether or not your hard drive can be recovered, give us a call and let us answer any questions you might have. The call is free, there is no pressure to make a commitment and we're available from morning till late at night on our local hard drive recovery London number - 0207 118 6880. What Are The Indicators Of A Hard Disk Drive Failure? These aren't scare tactics, simply facts, at some point your hard drive will fail; it simply makes sense to be prepared for that eventuality. If you've experienced any of the above, call us or fill out our contact form and let us help. Not sure what kind of hard drive you have, call us toll free, we're here to help and ease any stress you may be feeling. While there are a multitude of possibilities, basically there are three reasons..
Electronics may fail based on electrical surges, however while this may stop you from accessing your data, it is likely the data itself is still intact and can be recovered. Heat is a constant nemesis; however most systems (unless a cooling fan fails) are designed to operate within safe temperature parameters. Physical damage may happen if a laptop (or other device) is dropped or otherwise suffers blunt force trauma. Our team of hard drive recovery specialists have likely seen all (or most) hard drive issue, and in almost every case we've been successful in hard drive recovery, let us do the same for you. You will be informed on any updates either by email or personal phone call. 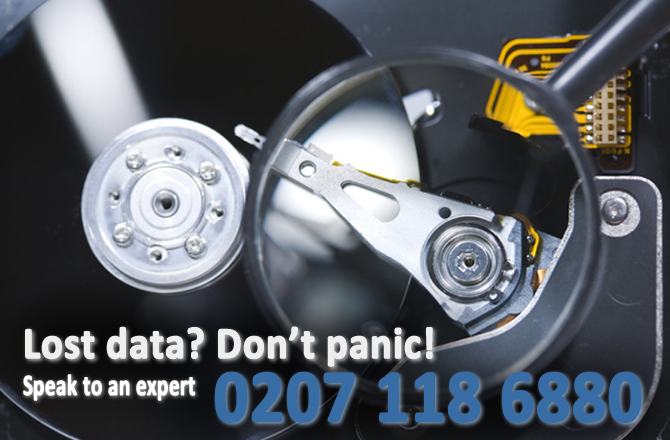 You can also call our dedicated London hard drive recovery support number on 0207 118 6880 if you have any questions.